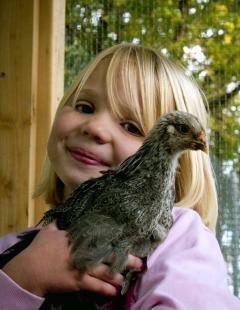 This is our first experience with Chickens- they are 11 weeks old (the pics are @ 6 weeks) and finally out of the garage and into the nearly finished coop. 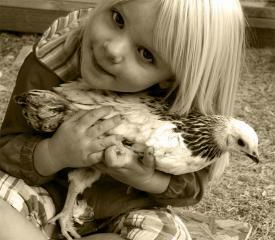 We have 4 light brahmas (Flower, Daisy, Helga and Contessa) and 3 dark brahmas (Clementine, Dixie, and Hyacinth). It's looking like Flower and Helga are both roosters- Flower is being called Floyd now, and Helga still hasn't been renamed- we are leaning toward Mercury- the Roman god with wings on his feet. 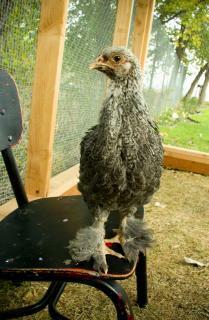 Being a brahma the feather footed thing seems to fit. My little girls love them. 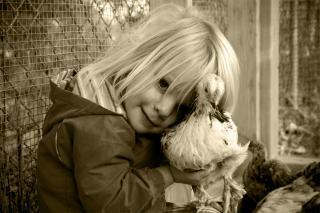 Gracie told us as she snuggled this one "This chicken loves me!" It has been an expensive adventure- but the girls love them- and that makes it priceless. I will be posting pictures of our coop progress as well.